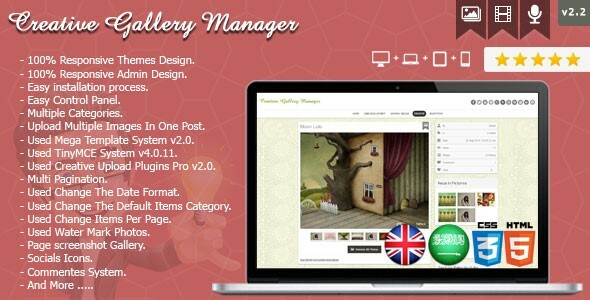 Creative Gallery Manager v2.0 - CODELISTPRO | Free Premium Scripts, Plugins, Apps Source Code. 100% Responsive Themes Design. 100% Responsive Admin Design. Language [ English – Arabic ] RTL Easy installation process. Easy Control Panel. Multiple Categories. Upload Multiple Images In One Post. Used Mega Template System v2.0. Used TinyMCE System v4.0.11. Used Creative Upload Plugins Pro v2.0. Multi Pagination.